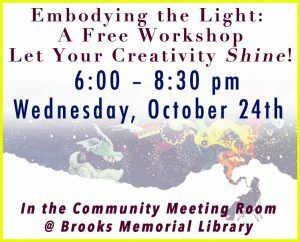 Join Deidra Razzaque on Wednesday, October 24th, from 6:00 – 8:30 pm for a FREE hands-on workshop, where participants will work together to explore where they find inspiration and how they can best utilize it. This workshop is designed for high school students and adults. Please register by October 17th by emailing deidrarazzaque@gmail.com, or call 802-579-4491. Which artists, or other creatives, feel like kindred spirits to you? You may be drawn to people whose styles and techniques you’d like to emulate. And you might gravitate towards people who create in very different ways from you. Perhaps you are inspired by their perspectives and a shared sense of the impact you want your art to have in the world. Years ago, workshop facilitator, Deidra Razzaque, created a WOW Family for herself. This “family” is comprised of singers, visual artists, writers, and community activists whom she envisions as an accepting,encouraging family, saying, “Wow, that’s amazing! Go for it!” regarding her creativity. Workshop participants will begin creating a “WOW Family” equivalent that meets their own heart’s yearning. They will leave with visual encouragement that illuminates their creative path.Deidra K. Razzaque wears many hats, including writer, collage artist,trainer, educator, and transformative travel coach.